Aggregators are computer software or websites that can bring together information from multiple online sources. For example a news aggregator will collate information from other news sources or a review aggregator will collate reviews of films or products. Whenever you see the icon above this means that you can subscribe to news feeds from this particular website or blog. You can read these feeds using an RSS Reader, examples of which I’ve given below. The reader will aggregate all of the feeds you subscibe to and present them as headlines and an into to the new information. The advantage of this is that you don’t need to keep checking for updates, the reader will collate them for you and you can then read them at a time convenient to you. Common Craft have created a RSS in Plain English video that helps to explain this further. Sadly Google Reader a very popular tool was disbanded. Below are some alternatives. Feedly compiles news feeds from a variety of online sources for the user to customize and share with others. Flipboard is your personal magazine, filled with the things you care about. Catch up on the news, discover amazing things from around the world, and stay connected to the people closest to you—all in one place. Content is presented in magazine format, and allows users to “flip” through their social-networking feeds and feeds from websites that have partnered with the company. Pocket enables you to save items such as articles and videos for later. Save directly from your browser or from apps like Twitter, Flipboard, Pulse and Zite. News.me finds the best stories from your Twitter stream and sends you a daily digest by email. You can also follow other people’s digests. There is the option in settings to create a Read Later bookmarklet and to send any tweets you favourite to this list. NewsCred is a quick way to gather news on topics of interest to you. Search for your own topics or select from world, politics, technology, business, sports or entertainment. 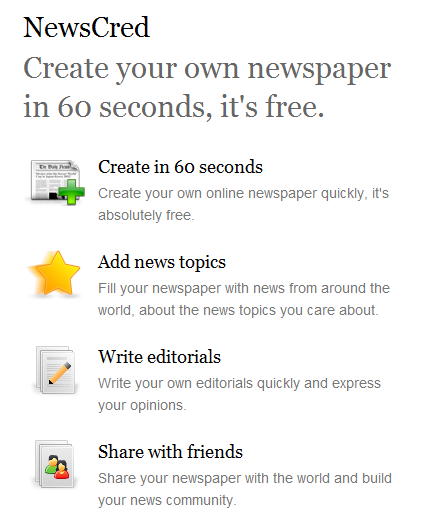 Then share your newspaper via Twitter or email. You can use Nuzzel to discover the best news stories shared by your friends on Facebook and Twitter without being overwhelmed or missing anything. Summify aggregates the most popular news within your social media streams. You can choose to connect Twitter, Facebook and Google. The content which has been retweeted, liked or favourited is aggregated together into one stream for you to read and share if you wish to. iGoogle was one of my favourites, but is yet another Google product that has been taken off the shelf. You could view a variety of different tools all on page selected by you. This might include Google reader (also now gone), the news headlines from the BBC or newspapers of your choice, a calendar, clock(s) GMT and international time zones, currency converter, dictionary and much more. Netvibes is another dashboard that allows you to aggregate feeds of your choice on to one page.